Saturday mornings during the month of July in the Tasty Catering warehouse are chaotic. Crews are everywhere, waiting to depart for their assigned picnics and special events while the warehouse and kitchen teams are scurrying about moving supplies, loading trucks, and packing orders. Loading crews are mostly seasonal workers—high school and college students whose minds have a tendency to wander to other, more fun summer activities. This particular day was extremely hot and humid, even in the morning hours. Steven, the supervisor on duty, was a college student and four-year veteran of summer employment at Tasty Catering. He noticed a high school novice loading Indiana-bound equipment on a Wisconsin-bound truck, a critical error in the catering business. To a novice, a truck is a truck and equipment is equipment. This particular fellow had yet to experience the terror and potential disaster of arriving at an event without the proper food or equipment. Creating a culture that gives each employee a sense of caring and ownership in the organization is a powerful tool for guiding behaviors. Here was a young employee not only feeling empowered to care about what was happening in another department but also feeling compelled and obligated to speak out when he saw a behavior that did not fit the Tasty Catering culture. Steven, likewise, listened and immediately responded to correct his own behavior. Both young men reinforced the culture and the notion that employees must respect each other, regardless of their assigned jobs. This is what crew leaders are trained to do when they see a violation of company values and when they realize they have made a mistake. But what created this sort of organizational environment? How can you unlock this in your own employees? Recent research has shown how customer satisfaction and the resulting financial gains from repeat, loyal business stem from emotional engagement within employee-customer interactions. Yet, organizations that are focused on excellence and high performance go beyond employee engagement to what we have identified as employee entanglement. At first blush, entanglement sounds negative. For most people, entanglement means being caught in a difficult and complicated situation from which it is a challenge to escape. Well, that does not sound like something an employee would want to voluntarily enter, let alone something an ethical leader would want to create. However, let’s look at the concept in a slightly different way. At the core of entanglement is tension, which is the condition of being stretched or strained, a state of mental unrest that seeks resolution and reduction of the psychological and physiological stresses that arise from the tension. Would anyone disagree that the mental challenges one faces in today’s rapidly changing environment are tension filled? We assert that entanglement can be a positive force within organizations, driving individuals, teams, and organizations to achieve better results because of the tension between the existing state, the knowledge that things can always be better, and the desire to make things better. At the root of entanglement rests the tension between the present and the desired future, between what is and what could be, coupled with the realization that change occurs in the vacuum between the past and the future along with the collective efforts of dedicated people joined by common values, purposes, or goals. Within our research, we found eight high-performing organizations in which the tension between organizational and personal expectations for excellence and the desire to see their organization excel drove continually better performance, outcomes, and sustainability. For the high performers described in this book, entanglement is the critical force that separates world-class from common performance, providing an organizational competency that makes leaders among peers. It’s these distinctive competencies that make imitation impossible and competitors irrelevant. Comparing employee engagement and employee entanglement is analogous to noting the difference between college athletes and Olympians. Carrying over this analogy to for-profit and nonprofit organizations, the “college athlete” is certainly a valued employee; however, the “Olympian” is someone who could change the future of the organization. The average college athlete may be a high performer who is engaged, but chances are he has his sights set on a variety of other things. Of course, part of his focus is on his training and his teammates, but he is also concerned about classes, assignments, his social life, his future—assuming it is not in sport—and so on. The Olympian, on the other hand, has a much narrower focus. She is far more tuned into achieving success at her sport, so her every action is concentrated on attaining her highest level of performance. She wants—no, she needs— to be the best, and all aspects of her life (her diet, her sleep, her training, her family support, her work choices) are entwined in her efforts to be the very best. Just as the Olympian interlaces all aspects of her life into her quest for gold (perfection in her chosen sport), an entangled employee does so for the success of his or her organization and the perfection of his or her own performance. Each decision, both within the workplace and outside it, becomes organization focused. Hugo Rios-Tellez is the perfect example of an entangled employee. He has a strong personal commitment to the goals and values of the organization. During our research, several entangled employees shared that people outside their organizations had “accused” them of “drinking the Kool-Aid and swallowing the company doctrine.” Rather than being insulted when charged with holding an unquestioning belief in their employer’s ideology, they embrace the spirit of the culture. The entangled employees are usually the first to admit that others may not fit within their company culture. Why? That is one question, along with several others, that this book answers. We wanted to know why these companies were so special in the eyes of their customers, their employees, the organization’s stakeholders, and those who would love to work for them. Let us introduce you to the companies we studied that have an environment that leads to remarkable results. According to the Institute for Human Health and Human potential, less than 10 percent of the human brain is involved when processing thoughts related to the task at hand. That leaves a little more than 90 percent of our thoughts—what we’ve come to label discretionary thinking—to wander. While “average” employees use a small fraction of their mental processing capacity for work, entangled employees devote more of their mental energies toward finding solutions to vexing problems, such as improving the quality and quantity of what they do to serve fellow employees, customers, communities, and constituents. In short, entangled employees allocate and direct more of their discretionary thinking toward organizational challenges, as Hugo Rios-Tellez and his colleagues at Tasty Catering do. Within entangled organizations, an overwhelming majority of employees think past the requirements of their position to ways that help the organization achieve maximum performance. This extra effort stems from a strong, developed, and well-maintained employee-focused culture. Leadership recognizes and rewards discretionary thinking so often and in such a way that this behavior becomes commonplace. For example, Dr. Jeffrey Oken of Advocate Good Samaritan Hospital (chapter 8) commented that members of the nursing staff are always asking him, “How can we make things better for you?” The nurses and technicians use their discretionary thinking to devise ways to improve service, which only means more positive action toward making the hospital better in serving others. Within each of the organizations we studied, we found similar instances of behaviors that made the difference in customer experiences and positive outcomes. Creating an entangled organization with entangled employees at every level does not happen overnight. Entangled structures exist because of specific actions leaders take along the way to create unique environments that employees love and protect. Leigh Buchanan, editor- at-large for Inc. Magazine, has described how emotional commitment has four times the power to affect performance compared with rational commitment. The 11 percent of workers Buchanan described as “true believers” are entangled employees. What would it be like if the majority of your employees were entangled rather than simply engaged or, worse, actively disengaged? Throughout this book, these critical factors have been and will continue to be conversation discussion points about organizational survival and success. And we found that the blending of these eight critical elements created a special synergy and magnetism within entangled organizations that gave rise to employee loyalty, engagement, and satisfaction—measures of success akin to financial success; customer loyalty, engagement, and satisfaction; and the effective and efficient use of resources. Because employees are key to meeting financial and customer-satisfaction goals, it is crucial to find the best in your staff and to see to it that they are moved from engaged to entangled. Each chapter of the book tells a story related to one of the eight critical elements, but as with a jigsaw puzzle, one cannot get the full picture of an entangled organization by looking at only one or two pieces. One needs to connect all the pieces to understand the synergy and magnetism between and among the pieces and to align them for maximum organizational effect. Synergy results from the cumulative power of all eight elements coming together, but magnetism results from an entirely different sort of power. Physics reveals that magnetic forces and force fields exist around bodies such as the earth. Magnetic forces help to hold the universe together and to balance opposing forces. In short, magnetic forces sustain relative tension between balanced objects. We’ve introduced the topic of magnetism because assembling the parts or recognizing some synergy between them is not enough. The parts cannot be taken singularly; they must be taken as a collective whole. Although synergy exists in such a way that the whole is much greater than simply a sum of the parts, synergy itself cannot describe the relationships we found among the elements of an entangled organization. With the entangled organizations we studied, we found that entanglement is positive tension within an organization. With high performers, we found that magnetism exists between and among unique individuals through shared values, goals, and behaviors—specifically trust and caring—that builds guilds and strengthens relationships. The interviews and archival research helped us identify this quality, and the analysis across the case studies confirmed it. Each organization we studied had its own quality—Kevin Sheridan called it magnetism—that stemmed from organizational purpose. Similarly, each organization demonstrated the eight elements in different ways and to different degrees, depending on their state of development. To make each element clear, we decided to focus on the story of the company that best exemplified that element. For example, Springfield Remanufacturing Corporation showed us how shared leadership within an industrial, profit-oriented setting generated discretionary thinking that led to performance excellence. And although every organization operated from a strong ethical foundation, we found Integrated Project Management Company exemplified how leaders can build and sustain an ethical company. The other organizations we studied had equally compelling stories to illustrate the other six elements. Chapter 9 brings the puzzle together and discusses what we refer to as the entangled organization as an integrated whole. This integrative chapter describes the essential elements involved in hiring and nurturing a high-performance and engaged workforce that sets out on a path to build this sort of organizational environment. 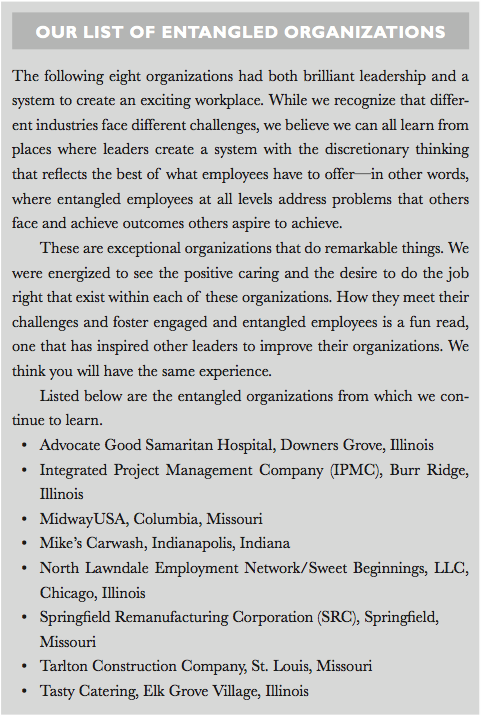 The chapters within this book serve as the puzzle pieces as well as the road map for achieving performance excellence through entanglement. As you finish each chapter, we hope you pause to think about what you could do, in whatever role you perform, to have a positive impact on the lives of coworkers, employees, customers, suppliers, and others on whom you depend to sustain your organization and make it prosper. Finally, for the benefit of academics who teach business students about organizational leadership, structure, and related theories, and for those leaders, consultants, and students who want to learn more about the theoretical and empirical foundations of what we saw, we have included support material on our website as well as in the endnotes. Within the realm of business, evidence- based research exists in pockets and silos; in some cases, it is so heavily anchored to a specific discipline that integration of some theories can be either missed or ignored. On the website we frame and integrate the theories behind the practices we observed, from which readers can draw their own conclusions about the strengths and weaknesses of the entangled organization. Other books may address the eight elements discussed within It’s My Company Too!, but the synthesizing model of the entangled organization makes this book unique. The entangled organization is clearly a performance excellence model for the demands of the twenty-first- century organization. In addition, our concepts are anchored to evidenced-based management research. Our conclusions are based on interpreting research rather than giving our opinions. Leaders at all levels of a business, as well as those who teach business subjects, should be knowledgeable and conversant on the topics discussed within these chapters. Senior Leaders and Executives. Getting things done through others is your stock in trade, but this book gives you additional ideas for creating a dynamic environment in which an energized workforce comes to work looking for new ways to delight customers or improve your organization. Changing an organization does not take huge financial investments; what it takes is a major investment in how you do things, how you structure things, and how you behave. The entangled organization is an organizational design that can help you accomplish these things. Middle Managers. Beyond the issues of structural design and leadership behaviors, we found effective leaders were more concerned with guiding the energy of others in the right direction rather than controlling their organizations. The entangled organization can show you the behaviors leaders need to reinforce and support and ways to structure the work environment to keep teams and individuals engaged. You start being a leader by leading yourself—managing your own career and working to enter a leadership position. Leaders of Not-for-Profit Groups or Government Agencies. Your organization must emphasize to your constituents the societal value you provide. Motivating others toward goals in an ever-shifting and uncertain environment requires more communication and engagement around the vision, shared values, and economic value the organization brings to others. The entangled organization can help you stimulate growth and achieve performance excellence on par with for- profit companies. Educators, Academicians, and Consultants. While we’re confident all readers can benefit from this book’s content, the material on the website and in the chapter 9 endnotes were written specifically with you in mind. As business leaders and owners as well as educators, academics, and consultants, the author team saw the need to share the theoretical foundations of our findings with the varied audiences who teach and guide leadership and organizational science, design, or behavior in different venues. Although the literature is wide-ranging, we also wanted most of it to be readily accessible to educators and consultants outside of academia who may not have access to large databases such as EBSCOHost or ABI/INFORM. Thus, sources from Harvard Business Review and others are common references. It’s My Company Too! has resonated with the various audiences with whom we work, from the classroom to the boardroom. The book can help you guide discussions about designing organizations for sustainable success in advanced graduate courses in MBA and doctoral programs, as well as with senior leaders with whom consultants work. Business Students. The literature related to leadership, organizational science, and culture is overwhelming, so what should you read? How can you best use the limited time you have available to get the most concise picture of critical concepts related to organizational success? Chapter 9 and the material on the website should serve as a foundation for your learning on these topics as well as a springboard for additional research. A critical review of the literature should boost your knowledge and ability to apply the elements that comprise It’s My Company Too! in real-world settings. We hope that doctoral students will consider additional research into the concepts and model discussed in this book, especially in the domain of positive organizational scholarship and positivity. It’s My Company Too! can help you see the tapestry of behaviors, thoughts, and actions that lead to the sustainability of winning enterprises. Noted statistician and quality management guru W. Edwards Deming once said that 85 percent of organizational problems were system-related, while only 15 percent were related to people. Based on our experiences and conversations with leaders at all organizational levels in varied industries, we agree with Deming’s assessment that many perceived behavioral problems are really system problems that resulted in such behaviors and attitudes as apathy, complacency, lack of motivation or attention to detail, or indecision. So how do you overcome these deficiencies? The eight organizations highlighted in these pages have done just that. This book is about real people, real organizations, real challenges, and very real success. The subjects of this book have systems in place that encourage high performance. The leaders within these organizations support the systems and behaviors of their team members or associates who sustain cycles that continually improve their organizations and more deeply entangle coworkers, customers, and suppliers in the process. Regardless of the industry in which they operated, those we interviewed expressed pride in the values, leadership, and reputation of the organization in which they served. Deep respect was evident in the ways organizational leaders valued employees and honored them through recognition programs, compensation, joint decision making, training, and development. Employees shared this respect and honor through their contributions as discretionary thinkers. While organizational leaders cannot ignore the forces that shape the competitive market, neither can they ignore the deep impact their leadership and the culture they create and nurture has on the internal operations and behaviors of the people who look to them for direction. We hope you enjoy reading this book as much as we enjoyed the experience of learning about these eight remarkable organizations.